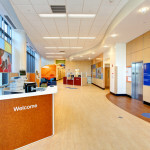 Designing for pediatric facilities take special thought and consideration. 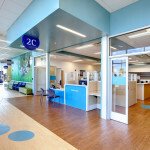 Quentin Elliott, director of healthcare design at Moody Nolan, shares his thoughts on key elements for pediatric ambulatory care spaces, including designing positive distractions to improve the experience and using color and images to appeal to kids from newborn to their twenties. 1. Flexibility for today and tomorrow. Healthcare is changing rapidly and we know that more care will be provided in comprehensive ambulatory care settings located off the main campus and closer to home, especially in community-based pediatrics. Moody Nolan recently completed an 80,000 sq. ft. multi-specialty clinic for Cincinnati Children’s Medical Center in Green Township, Ohio. Nine clinics and nearly 20 service lines are offered at the center, which means that some spaces may be used by the orthopedic clinic part of the week and another specialty on other days. The facility features a standardized floor plan that provides identical clinical modules with clear separation of public and clinical circulation. 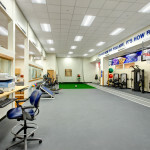 This allows programs to flex and expand or contract over time without heavy renovation. It’s really about designing for the family unit and using colors, patterns, artwork, and interior features that appeal to all ages. What’s interesting to a 3-year-old would be insulting to a tween, so you have to blend a variety of colors, elements, and images to capture your entire audience. 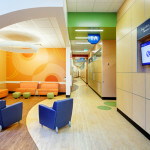 Ambulatory pediatric spaces today also serve a variety of patient populations. Some are first time users getting a physical for school sports while others are “frequent flyers,” who may regularly visit the center for tests and treatment. To accommodate this range, self-serve kiosks may be provided for the repeat visitors, while personalized registration is still available. Since parents may have other children and family members in tow, the design should also include additional space at the supervised registration stations for extra kids, strollers, car seats, or wheelchairs. Pediatric spaces need to be friendly, open, and accessible while providing the ability to secure all or portions of the building depending on the time of day. At Cincinnati Children’s Green Township facility, the open, glass-constructed concourse brings light into the interior of the center and provides a neighborhood-like scheme for wayfinding. Special attention to detail must not be overlooked and can contribute to the welcoming setting. For example, a rolling security shutter over a registration window can become a beautiful mural when pulled down in the evening. Pediatric ambulatory centers are not just about providing healthcare services but also about building relationships within the community. Designing these centers for children’s hospitals requires a balance between extending their brand and including visual indicators of the community. During planning of the Green Township facility, the client sponsored art sessions for local children, and the design team incorporated some of the children’s art into the completed facility. Another priority for pediatric ambulatory centers is to make children and their families feel comfortable. The design team needs to think about adding positive distractions that keep children and their families occupied while they wait for appointments. For example, we’ve incorporated colored panels into the floor that light up when a child steps on them and used “neighborly” seating in the waiting areas so families can sit together and not feel like they’re on display. This article appeared in the Take Five Series for Healthcare Design magazine on January 14, 2014. In this series, Healthcare Design asks leading healthcare design professionals, firms and owners to tell them what’s got their attention and share some ideas on the subject.